Guy Whittingham has called for more of the same from Dan Butler as he continues to make massive Hawks strides. The 18-year-old was named player of the month for Lee Bradbury’s side during what has proven to be an impressive loan spell. Butler has been a regular at left-back, making seven appearances and recently extending his stay for another month. Those displays prompted recognition as the Hawks’ player of the month for November. And Whittingham continues to be encouraged by the youngster’s progress. He said: ‘Dan is doing well. We know Lee (Bradbury) and Shaun (Gale) and we know they are looking after him. ‘He’s fit, got a good left foot and gets up and down the pitch. ‘Of course he has got things to work on – he knows that – but part of him going out into in a first-team environment is to know the importance of winning and losing games, which is massive. ‘It’s just what he wants and it’s what we hoped would happen. ‘Our aim has been to get three or four months of training with the first team into the guys and then go out on loan and get some games and match fitness. ‘Then come January, if everything has gone our way, we start including him in first-team squads. 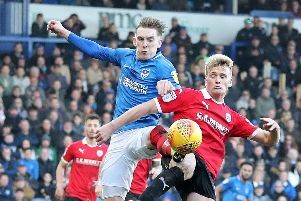 Butler is one of five Pompey youngsters out on loan in non-league football. Jed Wallace is at Whitehawk, while Elliot Wheeler is with Bashley. Dan Thompson opened his Dorchester goal account last week, although George Colson has struggled to break into the Blue Square Bet South club’s squad. Whittingham added: ‘I went down to Dan’s first game for Dorchester expecting to see him and George playing. ‘But one was on the bench and one wasn’t. ‘Dan came on with 12 minutes to go but I stayed until the end. ‘He texted me the next day saying “didn’t start, came on, played well”. ‘So I texted back and said “hmmm, talk me through playing well”. He didn’t realise I had gone!